RANGOON—The annual new year festival of the Naga ethnic tribe left well-heeled tourists and local visitors suffering a string of disappointments due to tactless government interference. “I'm not interested in going to the Naga festival again. The trip was very expensive, but the food was still very poor and the accommodation was very poor—toilets broke down,” said an American tourist who wished to remain anonymous. Even visitors' minor expectations of visiting traditional villages were thwarted as they were stopped by the Burmese authorities. “We couldn't see villages beyond the festival,” added the tourist. International travelers were charged a small fortune to visit the new year celebration, some shelling out US $1,500 per person to private travel agencies. Locals also found it expensive, spending around 500,000 kyat (around $600) for the trip to the hilly area of Sagaing Division, towards the Indian border in Burma's northwest. The annual festival is held for two full days each January. The first day is set aside for rehearsing traditional dances, with the second day for the festival proper. Ethnic tribespeople strut their stuff in the afternoon and evening in front of a clamoring throng of spectators. But unfortunately for tourists and locals alike, the first day's activities were canceled this year as ethnic tribal dancers had to welcome Burmese VIPs including Vice-President Tin Aung Myint Oo. He is the first high-ranking government dignitary to visit the festival, which was long neglected by previous administrations. But that was just the start of the disappointments. The afternoon dance of the second day was also severely curtailed due to a lengthy donation ceremony featuring the vice-president and his entourage of businessmen from more than 20 companies. “They could only dance in the evening, so we couldn't take any good pictures because there was no light,” photographer Ko Moe told The Irrawaddy. 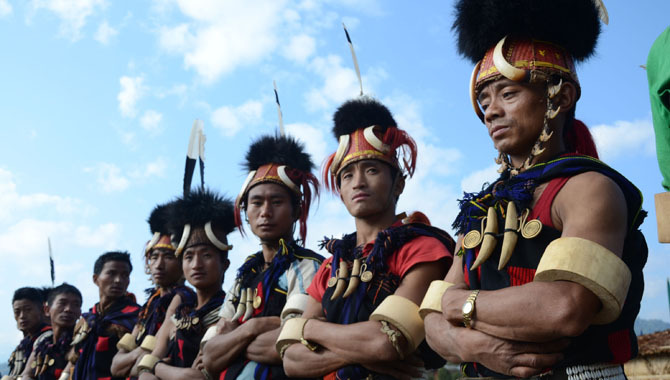 Around 400 Naga tribespeople from 20 different villages gathered at the festival. But the audience was still left feeling like they had witnessed a crass publicity stunt. “Another disappointment is that when the Naga people danced, the businessmen and officials also danced along with them,” Ko Moe said. Tourists told The Irrawaddy that they were left in the dark about what was happening and never received any information about the schedule apart from what time to turn up for lunch and dinner. The only redeeming feature of the experience was the jeep drive through stunning scenery from Leshe to Hta-man-thi and the boat trip down the Chindwin River, they added. But there was even more dismay to come. A vehicle ferrying tourists to the airport broke down on the return journey, so many missed their domestic flights back to Rangoon. Some managed find a guesthouse in Homelin while others were forced to spend the night camping on the sand bank of the Chindwin River. “Many tourists also missed their international flights because they had to spend a night in Homelin, and it became yet another blow,” said Ko Moe. The number of tourists visiting the festival increased from around 10 last January to more than 35 this year. There were over 100 visitors at the event seven years ago, but numbers have dwindled every year since, claims a photographer who visits regularly. “During my last visit in 2009, I discovered that many ethnic men no longer enjoy their annual traditional festival. They find it very tiring to make the journey every year,” he said. “That year they were forced to stand for nearly two hours in the blazing sunshine to take part in the opening ceremony of a library in the town. If one really value the human whoever they are, best thing them is to leave them very well alone as it has been for centuries. No monkey circus like the idiotic fake village in Rangoon copying the Thai exploitation will do any good for anybody. In truth nobody really care about the Naga anyway rather than as monkey circus. Absolutely disappointing to know that the Burmese government interrupt a unique ethnic culture. Naga has every right to celebrate their culture on their own schedule and expense.The so called provision of fund and material is nothing meant to Naga people rather goes to a certain people. Naga people don't receive any advantages of it but tiredness and disappointment. The so called Naga MPs have no right to speak out loud about it because they are the puppets of the USDP. Naga new year festival must be free from intervention. A clear example of government officials not only hindering an culture event but also spoiling it for years to come. It demonstrates the absolute lack of knowledge of what makes the world go around. This festival if properly marketed could have be an tremendous advantage for the country. The generals always talked about being afraid of losing one culture identity where in fact they are the ones who are tearing it apart. If the constitution really included all the ethnic tribes, the Naga MP would have demanded that the government should look after every detail of the visiting tribe people as they are the true bearers of the unique cultures of our land.